Pranava or AUM is an important hymn discussed by most of the Indian philosophical schools. While other schools describe this as either a symbol of God or a path of self realisation, Tantra Sastra interprets Pranava as 'sabdabrahman'. It elaborates from the state of sound formation to self realisation. Even though there were earlier studies dealt with this particular subject, this study focuses on how these interpretations differ in its own way. It elaborates on how 'pranava mantra' stabilize a positive energy in this contemporary life situations. Dr. Rekha G.S. is working as an Assistant Professor in the Department of Vedanta, Sreesankaracharya University of Sanskrit, Thiruvananthapuram R.C, She has published ten articles and presented many papers in International and national Seminars. 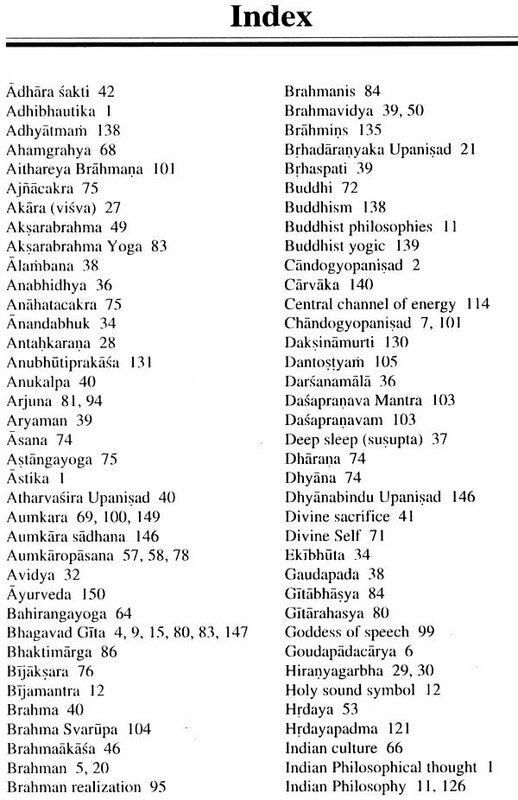 In Indian Philosophical systems a number of studies occur to the concept of pranava. 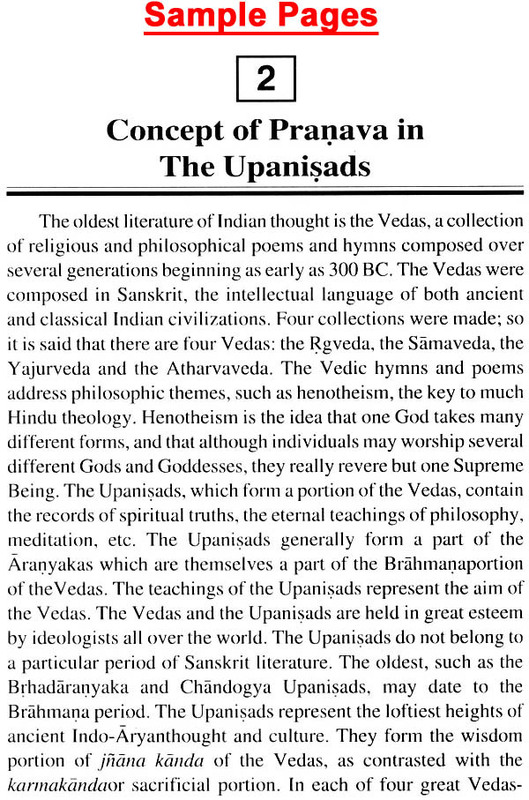 The present study 'The Concept of Pranava in Indian Philosophy' focuses on the concept of pranava as described in various philosophical ideals. The possibility of the current subject being prominent with its religious, cultural and scientific aspects worth exploring. The concept of pranava is illustrated in most of the orthodox and heterodox systems of Indian philosophy. Tantra has been included in the form of a chapter; through commonly Tantra is not a system of Indian Philosophical Schools. But the concept of aum is elaborately discussed in this system. Here Tantra is treated as a philosophy with great prominence with the support of the statements from MadhusudhanaSaraswathi's 'Prasthanabheda', Bhaskararayar 's 'Varivasyarahasya' and Sayana's 'Sarvadarsanasamgraha' etc. All the philosophical schools emphasize that philosophy must have a positive impact on the life of man. All systems agree that the philosophy should help man in realizing the main ends of human life. The basis of all philosophical systems is that the truth and reality should be verifiable. Most of the Indian philosophical schools accept the ideals of moksa and advise to reach it through various routes. Though there are several means of attaining self-realization, the most script means that people can adopt, irrespective of their caste, creed, or age is 'pranavopasana', This could also be taken up by both schools and uneducated people. 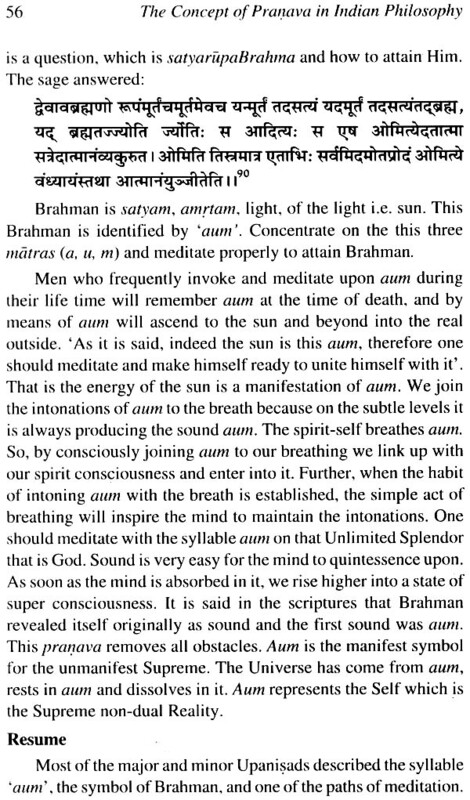 Here the importance of the sacred monosyllable aum. Aum is considered as the sacred mantra of Indian religious thoughts. The divinity of awn is established and explained in all the ancient Vedic and Sanskrit traditions. This work is divided into seven chapters. 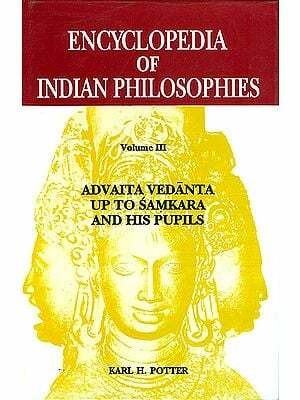 The first chapter is an Introduction on the Indian Philosophical systems. The second chapter, 'Concept of Pranava in the Upanisads', provides a discussion on how the major and minor Upanisads had approached the sacred mantra, awn as a symbol of Brahman and also as Brahman itself. The third chapter, 'Concept of Pranava in the Yoga philosophy', deals with the detailed explanation of 'awn' in the Yoga Darsana and its contemporary relevance. The fourth chapter, 'Concept of Pranava in the Bhagavad Gita' gives a description of the concept, of aum as discussed in the Bhagavad Gita. The fifth chapter 'Concept of pranava in the Tantra Sastra', deals with various aspects of awn discussed in the Tantric system. 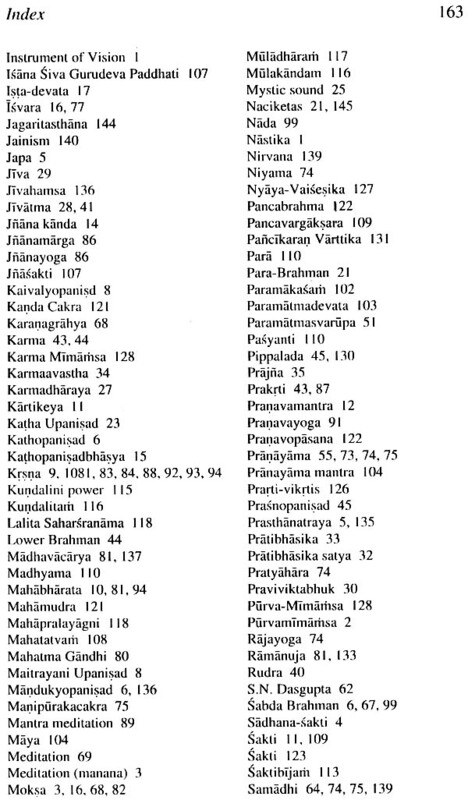 This chapter mainly focuses the ‘Traivedika Sandyapaddhati' of Vaiasaki. 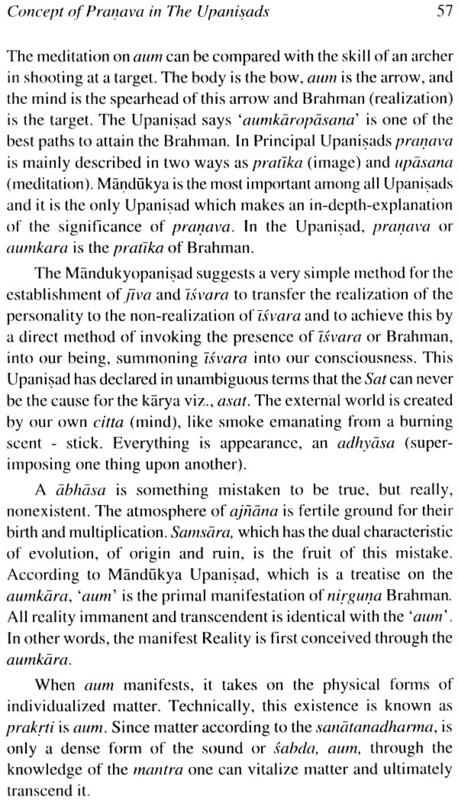 The sixth chapter, 'Concept of pranava in other systems of Indian philosophies', discusses the concept of pranava in the Samkhya, the Nyaya-Vaisesika, the Purvamimamsa, the Uttaramimamsa, the Buddhism, the Jainism, the Carvaka systems. The seventh chapter, ‘Conclusion’ is the summation of the research. I undertook this study under the supervision of Dr. S. Sobhana, Associate Professor, Department of Vedanta, Sree Sankaracharya University, Regional Centre, Thiruvananthapuram. I take this opportunity to express my sincere gratitude to her for the guidance and encouragement. I wish to thank all the members and teaching staff of the Department of Vedanta, Sree Sankaracharya University of Sanskrit, Kalady and the Regional Centre, Thiruvananthapuram. I owe a great depth of gratitude of C.R. Kerala Varma, the author of Traivedikasandhyapaddhati. I express my deep sense of gratitude to Dr. R. Raman Nair for his timely help and suggestions for my thesis. I express my deep sense of gratitude to all my friends and family members for their help. I also express my sincere thanks to the staff of University Library for providing all necessary facilities. The etymological meaning of the word 'Philosophy' is 'love of learning.' It signifies a natural and a necessary urge in human being to know themselves and the world in which they 'live and move and have their being'. It is incredible for man live without a philosophy. Indian philosophy has been, however intensely spiritual and has always stressed the essential of practical realization of truth. To understand Indian philosophy one must fully grasp the meaning of the word' Darsana,' It means 'Vision' and also the 'Instrument of Vision.' It stands for the direct immediate and intuitive vision reality, the actual perception of truth, and also includes the means which lead to this realization. Annihilation of the three kinds of pains- adhyatmika (physical and mental sufferings produced by natural and intra-organic causes), adhibhautika (physical and mental sufferings produced by natural and extra organic causes), and adidaivika (physical and mental miseries produced by super natural and extra organic causes)and realization of the Supreme happiness is the end, and sravana (hearing the truth), manana (intellectual conviction after critical analysis), and nididhyasana (practical realization) are the means- in all most all the schools of Indian philosophy. The nine systems of Indian Philosophical thought have been conventionally classified into two, the orthodox system and the heterodox system (Astika and Nastika). 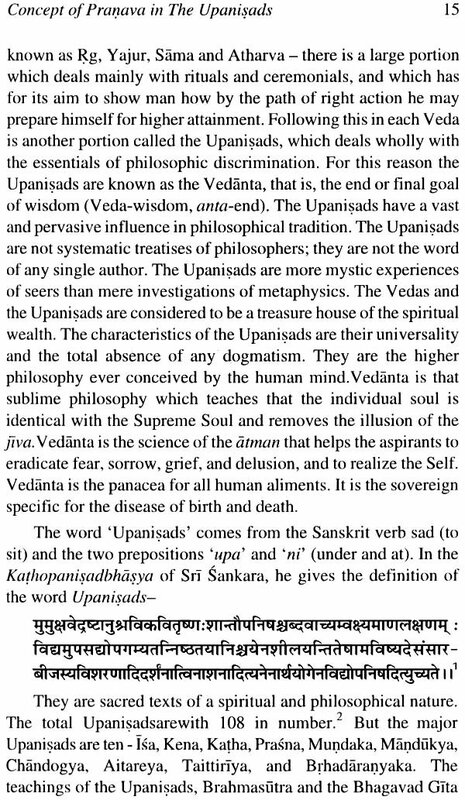 The classification has been made on the basis of whether or not a system believes in the infallibility of Vedas. The Orthodox systems, Samkhya, Yoga, Nyaya, Vaisesika, Purvamimamsa and Vedanta are directly or indirectly accept the Vedas. Buddhism, Jainism and Carvakism become to the heterodox system and they repudiated the authority of the Vedas. All the classical systems aim at adscription of all the phenomena of the universe and explore the true nature of the Supreme Being and its relation with the individual soul and the external world. The final goal of life is the attainment of the Reality which is established by philosophical discussions. Among the four prasthanas (dharma, artha, kama and moksa), moksa is the highest because there the soul attains liberation from all bandages. Dharma, artha and kama bind the soul to worldly affairs and cause a series of births and deaths. The being of Indian Philosophy can be found in the Vedic hymns. The prime objective of the different schools of Indian Philosophy is to investigate the solution to overcome the worldly desires and attain the Supreme Reality. This investigation starts from the Vedic period and still this is to endure. All human beings are searching for the true paths of attain the Supreme Goal. AIl our ancient sages and Philosophical systems are meant to advice us the various paths to attain realization like, idol worship, sacrifices, japa, dhyana etc. Here mantra, japa and dhyana are most powerful paths to attain the Reality. 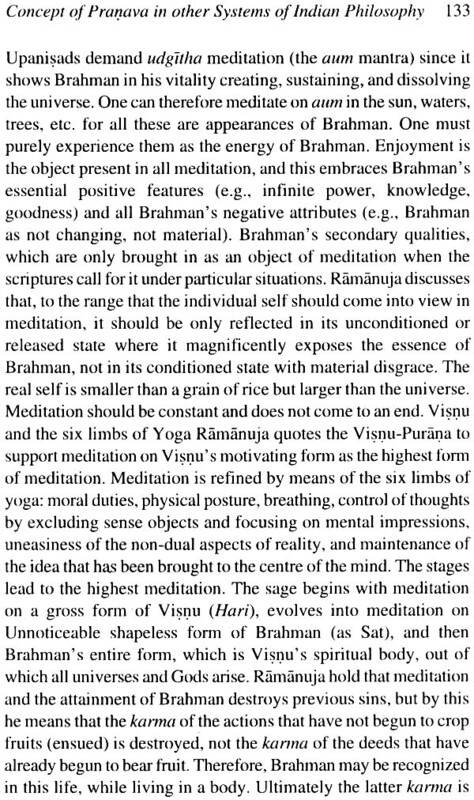 This work is an attempt to give a brief sketch of the place and the importance of pranava (aum), a medium of realization discussed in various Indian Philosophical schools. According to Swami Sankarananda, the word might have been derived from 'soma' the name of acentral deity who is mentioned in the Vedas frequently and with whom many esoteric rituals are associated. The word is also linked to the sound of breath and a subtle and high potency universal vibration which can be heard internally in the subtle planes as a deep sound (pranava nada) by the adepts all the time. It is possible that the word might have been integrated into Vedic religion from some ascetic tradition of ancient India. 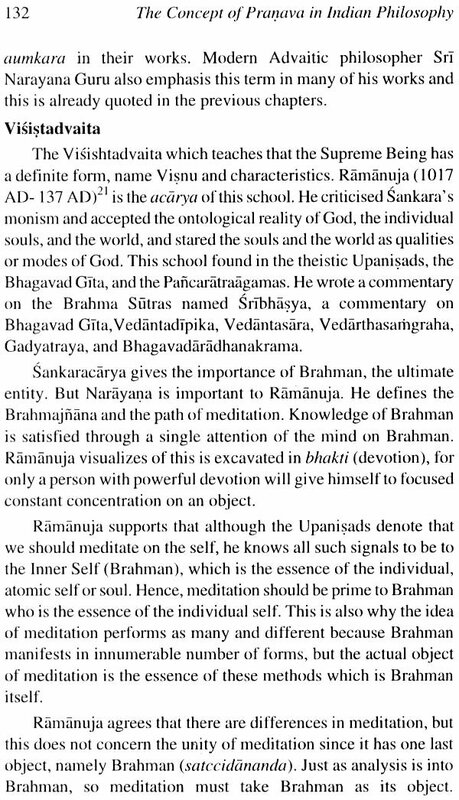 The Candogyopanisad describes how the syllable aum issued forth from Brahma as he brooded upon the worlds he created in the initial stages of creation. From his brooding first emerged the threefold knowledge (trayi vidya) and then the syllable bhur, bhuvah, and svah. When he brooded upon them, the syllable aum issued forth from them. Thus symbolically, aum represents the entire creation manifested in the three planes, namely the earth, the mid region and the heaven. The word aum is not cited directly in the earliest hymns of the Rgveda, but it is mentioned in the other Vedas and several Upanisads related with them. Initially, in the early Vedic period, because of the sacredness associated with it, the word was kept as a secret and never uttered in public. It was used in private discussions and passed on from teacher to believer or father to son directly and in secrecy. It was not used in the rituals. 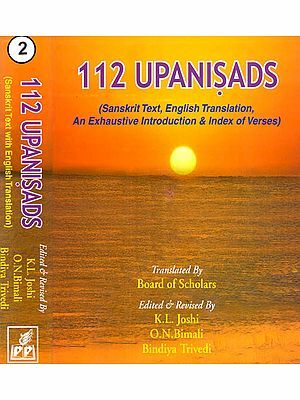 Because it was not acceptable to use the word directly, some early Upanisads referred to it indirectly as the udgita (upsound) or pranava (calling out), alluding to its significance in regulated breathing and religious chanting respectively. Other expressions used in the scriptures in reference to it are vacaka (symbol), tarka (crossing) and aksara (eternal word). It is also described as Brahman is sound form (SabdaBrahman). Historically aum is first mentioned in the twelve verses of the ancient Vedic text the Mandukya Upanisad, which explains the three basic states of consciousness: waking, sleeping, and dreaming. In its original pronunciation, aum (pronounced ahh-uhh-mm) is a blending of those three states of consciousness into the one-ness of three distinct syllables: a, u, and m. these three vibrations also represent the three stages of life: birth, living and death.